Published Aug. 15, 2018 at 1:15 p.m. 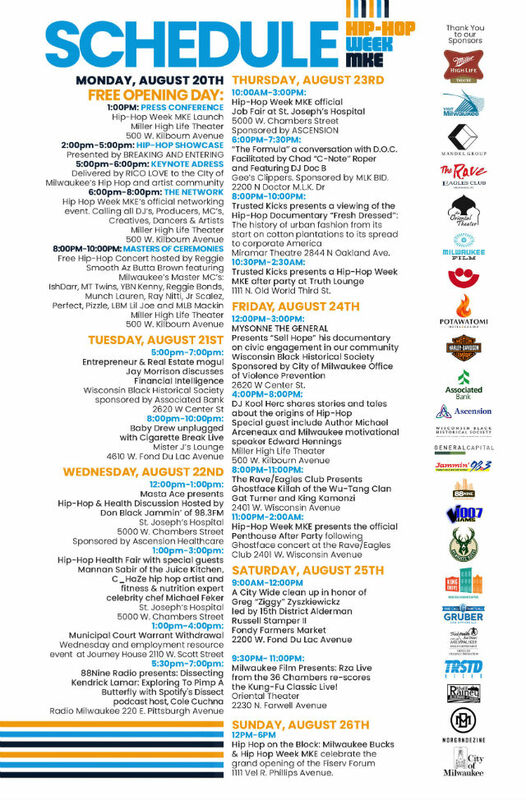 Brew City's inaugural Hip Hop Week MKE kicks off on Monday, Aug. 20 and offers a full slate of events, from documentary film screenings to networking events to lectures to performances by the likes of Ghostface Killah and Milwaukee's own Baby Drew. The granddaddy of hip-hop, DJ Kool Herc, will also make an appearance. A full schedule of events can be found below. The event is the brainchild of Ald. Khalif J. Rainey, who sponsored legislation that created Hip Hop Week MKE. Recently, Rainey also made a pitch for the city to host Jay-Z's annual Made in America festival. While that effort was unsuccessful this time, Rainey still has a lot to be proud of in Hip Hop MKE, which looks to be an engaging week full of great music, informative discussions not only about music, but about wellness, violence, civic engagement and financial literacy, and helpful programming, too, like a health fair. "I've always known the true innate transformational power of hip-hop and I wanted to bring that to Milwaukee in a meaningful way with Hip Hop Week MKE – taking place for the first time ever at venues across the city," Rainey said. "I encourage everyone to come out and be a part of Hip Hop Week MKE, attend performances, come to seminars to learn and ask questions and to see what the array of events has to offer."